Some plant parts are found as fossils in an unaltered form, either as body fossils or as chemical fossils. Pollen grains and spores (FIG. 1.58 I , diatom frustules, cuticle envelopes, various types of resins, such as amber (FIG. 1.59) and calcium carbonate remains of certain types of algae are all examples of unaltered plant fossils. In some instances even the soft parts are sufficiently preserved so that comparisons can be made at the cytoplasmic and ultrastructural level (Wolfe et al., 2006). incorporated into peat bogs, and because of the high acidity in the bogs, microbial activity is greatly reduced, so little or no decomposition occurs. The accumulated plant debris may build up to a considerable thickness, and while there is some disassociation of plant parts as well as flattening, the bits and pieces preserved can be handled like the same parts of modern plants. Another excellent example of unaltered plant material is diatomaceous earth. Although the cell contents are no longer present, the silica cell walls remain intact and are preserved in such fine detail that the exquisite sculpturing can be easily detected on the surface. of grasses and some trees and, depending upon the species, vary in morphology and size (FIGS. 1.62, 1.63). Although they have been used for many years to study Holocene or Pleistocene habitats, recent research has utilized these plant markers to study older paleoenvironments. They have been especially useful in the interpretation and reconstruction of grassland ecosystems (Strömberg, 2004). Extracting fossil phytoliths can be accomplished using a variety of techniques (Parr, 2002), but it is important to avoid methodological bias, as discussed in Strömberg (2007, 2008). the spore or pollen grain is composed of an especially resistant material called sporopollenin. As such they also represent unaltered plant material. Spores and pollen grains may be common in certain rocks, even when there is no evidence of any other plant parts. It is possible to extract these pollen grains and spores from the rock and mount them on microscope slides. TEM has provided a wealth of new information about fossil pollen and spore walls that has been used to examine the development of the pollen wall (Taylor and Alvin, 1984). 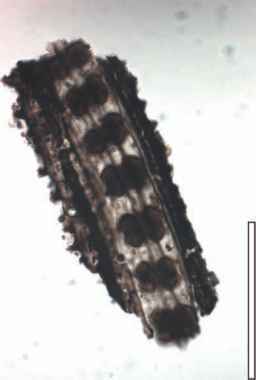 More recently, Scott and Hemsley (1991) have discussed the value of laser scanning and scanning acoustic microscopy in the study of paleobotanical materials. Chemical fossils can also represent a type of unaltered plant material (Hemsley et al., 1996). Chemical signatures, sometimes called biomarkers or geomolecules, are specific for certain groups of organisms. These biomolecules are transformed through time with lipids perhaps having the best opportunity of being preserved (Itihara et al., 1974), whereas nucleic acids degrade more rapidly (Briggs et al., 2000). Biomarkers in the form of terpenoids have recently been reported in the fossil wood type Protopodocarpoxylon from the Jurassic of Poland (Marynowski et al., 2007). An example of chemical preservation is the presence of hydrocarbons within Ordovician oil deposits that are known to be produced only by the putative cyanobacterium Gloeocapsomorpha (Hoffman et al., 1987; Foster et al., 1989; 1990; Blokker et al., 2001). Pristanes and phytanes are also a type of biomarker. These molecules are believed to be derived principally from chlorophyll degradation, but can also be produced by non-photosynthetic organisms (Hahn, 1982). A number of new techniques have been added to the arsenal of the paleobotanist, and these promise to provide significant advances in a number of areas. They include elemental analysis, chemolysis, pyrolysis, and lipid analysis, and have been used to study a large number of organic compounds throughout the geologic column. Pyrolysis and chem-olysis have been used to screen for the chemical composition of the fossil material. Such procedures and techniques have increasing application in determining the systematic affinities of a particular organism, as well as determining various taphonomic processes that may have altered the fossil. These various paleobiochemical techniques involve the extraction of organic constituents still associated with the fossil or represented as residues in the rock matrix. Classes of chemical compounds, such as sterols, aromatics, carboxylic acids, polysaccharides, various types of lignin, fatty acids, and n -alkanes, are but a few of the chemical constituents that have been identified in fossil plants. Organic chemical profiles have been used effectively with extant angiosperms and, at one time, chemosystematics represented a basic and almost routine technique in plant systematics (Crawford, 1990). 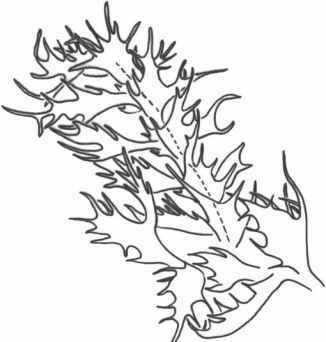 These techniques have sometimes been applied to the study of fossil plant systematics, but it is important to consider diagenetic changes, especially in older fossils. Niklas et al. (1985) used steroid and other cycloalkane-alkene profiles to show that a Miocene Liriodendron leaf was chemotaxonomi-cally more similar to one particular living species despite the fact that the fossil shares morphological characters with two living species. More recently, Mösle et al. (2002) demonstrated that the biomolecular cuticle signature was more comparable between more closely related plants, such as Cordaites and Walchia, than between these seed plants and certain coeval seed ferns. There are, however, certain limitations to such paleobiochemical approaches. For example, various microbial activities may alter the organic chemicals shortly after the organism dies, or there may be modifications to the chemical constituents as a result of diagenesis. Some organic compounds may have formed abiotically, rather than representing the original chemical constituents of the plants. Still others may have percolated through the surrounding rocks and constitute contaminants, even in rocks as hard as cherts. Thus, for paleobiochemistry to be useful to paleo-biologists, analyses must follow strict qualitative and quantitative protocols that can be standardized and repeated (Van Bergen, 1999). During the last two decades, systematists working with extant plants have switched, in part, from secondary metabolites to the use of molecular sequences, including nuclear, chloroplast, and mitochondrial DNA, as the macromolecules of choice in developing phylogenetic hypotheses for plant relationships. Golenberg and colleagues (1990) reported the extraction and amplification of an 820-base-pair DNA fragment from the chloroplast rbcL gene (ribulose-1,5-bisphosphate carboxylase-oxygenase or RuBisCO) of a Magnolia latahensis leaf. The leaf was collected from the famous mid-Miocene (Langhian) Clarkia beds of northern Idaho, which are dated at 15-15.5 million years old (Ma). In another study on fossils from the same site, Kim et al. (2004) reported amplified ndhF (NADH dehydrogenase) from the same type of leaf (M. latahensis), and rbcL from a specimen of Persea, further suggesting long-term preservation of ancient plant DNA. Recently, however, these studies and others, including DNA sequences from bacteria in insects in amber, DNA in dinosaur bones, and in salt crystals have been challenged on various grounds. As a result some believe that DNA in excess of 1 million years old is probably an artifact (Paabo et al., 2004). Others believe the study of ancient DNA holds promise at some level (Gugerli et al., 2005), but that the evidence must be compelling, and from multiple sources. Obviously, additional samples from the same site that demonstrate similar results will help verify such reports, and also a closely followed set of protocols will be especially useful in demonstrating the authenticity of ancient DNA (Gilbert et al., 2005). Although barely classified as ancient, an interesting study has recently reported 1000-year-old DNA from excavated wood samples using a strict set of procedures to insure that the material was not contaminated (Liepelt et al., 2006). 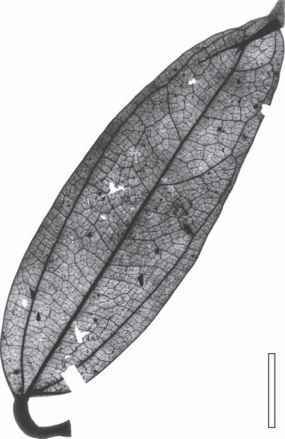 1996; Fukushima et al., 1996) and represent a special preservation type in which the plant tissue was rapidly dehydrated and buried (FIG. 1.64 ) . So well preserved are the cells and tissue systems of these mummified plants that they can be studied by the same techniques as those used to examine extant tissues. Mummified wood is not mineralized, so it can be sectioned using techniques identical to those utilized by wood anatomists for extant material.